Revolution - Eyeshadow Palette - Shook! 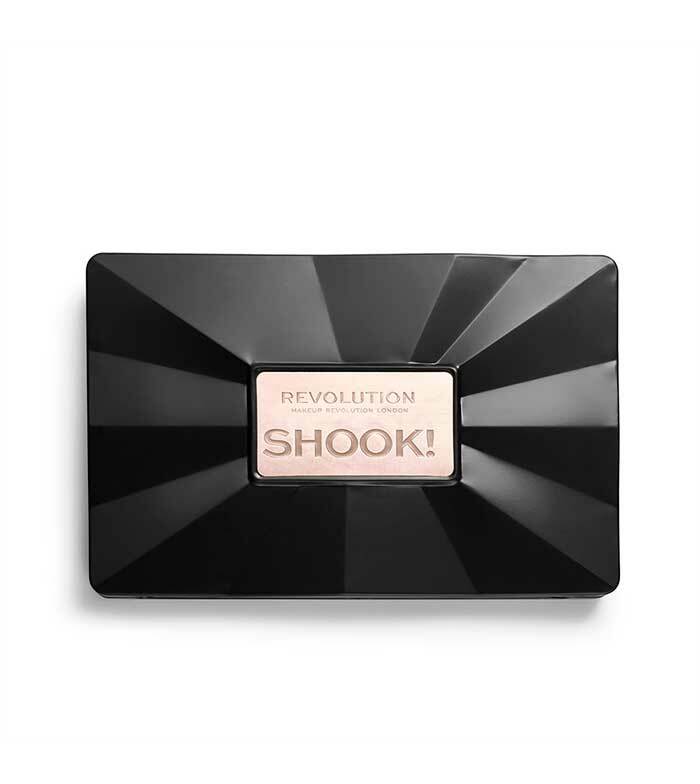 Revolution created a palette that will have you shook in no time! 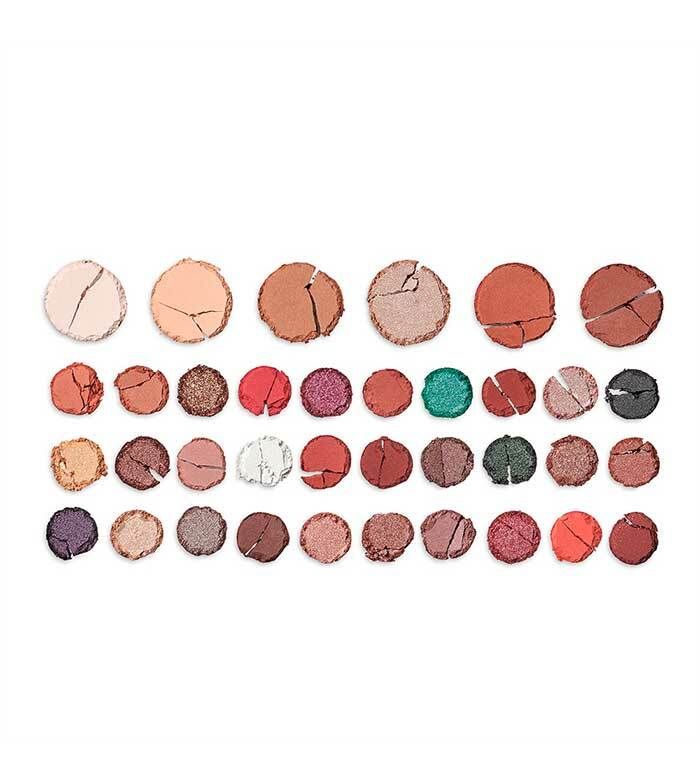 Shake up your makeup look with a 36-pan eyeshadow palette. 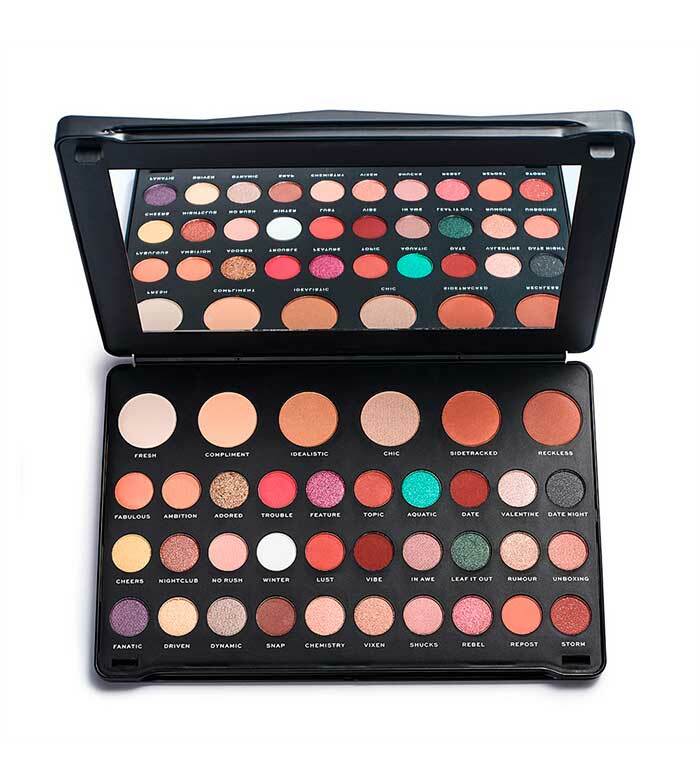 Packed with six transition shades and 30 matte, shimmer and glitter eyeshadows, this game-changing palette delivers on everything from everyday neutrals to statement hues. [+/- MAY CONTAIN/PEUT CONTENIR: IRON OXIDES (CI 77491, CI 77499), TITANIUM DIOXIDE (CI 77891), RED 40 (CI 16035)]. SHADE 28. INGREDIENTS (INGRÉDIENTS) MICA, TALC, SILICA, DIMETHICONE, PENTAERYTHRITYL TETRAISOSTEARATE, TIN OXIDE, HYDROGENATED POLYISOBUTENE, MAGNESIUM STEARATE, POLYETHYLENE, PTFE, TRIETHOXYCAPRYLYLSILANE, PHENOXYETHANOL, CAPRYLYL GLYCOL, IRON OXIDES (CI 77491), TITANIUM DIOXIDE (CI 77891). SHADE 29. INGREDIENTS (INGRÉDIENTS) MICA, TALC, MAGNESIUM STEARATE, DIMETHICONE, SILICA, PENTAERYTHRITYL TETRAISOSTEARATE, HYDROGENATED POLYISOBUTENE, POLYETHYLENE, TIN OXIDE, PTFE, TRIETHOXYCAPRYLYLSILANE, PHENOXYETHANOL, CAPRYLYL GLYCOL, IRON OXIDES (CI 77491, CI 77499), TITANIUM DIOXIDE (CI 77891). SHADE 30. INGREDIENTS (INGRÉDIENTS) MICA, TALC, DIMETHICONE, MAGNESIUM STEARATE, PENTAERYTHRITYL TETRAISOSTEARATE, HYDROGENATED POLYISOBUTENE, SILICA, POLYETHYLENE, PTFE, TRIETHOXYCAPRYLYLSILANE, PHENOXYETHANOL, CAPRYLYL GLYCOL, IRON OXIDES (CI 77491, CI 77499), TITANIUM DIOXIDE (CI 77891), RED 40 (CI 16035). SHADE 32. INGREDIENTS (INGRÉDIENTS) MICA, TALC, MAGNESIUM STEARATE, DIMETHICONE, SILICA, PENTAERYTHRITYL TETRAISOSTEARATE, HYDROGENATED POLYISOBUTENE, POLYETHYLENE, TIN OXIDE, PTFE, TRIETHOXYCAPRYLYLSILANE, PHENOXYETHANOL, CAPRYLYL GLYCOL, IRON OXIDES (CI 77491), TITANIUM DIOXIDE (CI 77891). SHADES 6, 7, 10. INGREDIENTS (INGRÉDIENTS): MICA, TALC, DIMETHICONE, SILICAPENTAERYTHRITYL TETRAISOSTEARATE, MAGNESIUM STEARATE, HYDROGENATED POLYISOBUTENE, POLYETHYLENE, PTFE, TRIETHOXYCAPRYLYLSILANE, PHENOXYETHANOL, CAPRYLYL GLYCOL [+/- MAY CONTAIN/PEUT CONTENIR: IRON OXIDES (CI 77491, CI 77499), TITANIUM DIOXIDE (CI 77891), RED 40 (CI 16035), RED 6 (CI 15850), MANGANESE VIOLET (CI 77742), RED 7 (CI 15850), RED 27 (CI 45410), ULTRAMARINES (CI 77007)]. SHADE 8. INGREDIENTS (INGRÉDIENTS): MICA, TALC, DIMETHICONE, SILICA, PENTAERYTHRITYL TETRAISOSTEARATE, MAGNESIUM STEARATE, HYDROGENATED POLYISOBUTENE, CALCIUM ALUMINUM BOROSILICATE, POLYETHYLENE, TIN OXIDE, PTFE, TRIETHOXYCAPRYLYLSILANE, PHENOXYETHANOL, CAPRYLYL GLYCOL, IRON OXIDES (CI 77491, CI 77492, CI 77499), TITANIUM DIOXIDE (CI 77891), RED 40 (CI 16035), RED 7 (CI 15850). SHADE 11. INGREDIENTS (INGRÉDIENTS): MICA, TALC, SILICA, DIMETHICONE, PENTAERYTHRITYL TETRAISOSTEARATE, HYDROGENATED POLYISOBUTENE, TIN OXIDE, MAGNESIUM STEARATE, POLYETHYLENE, PTFE, TRIETHOXYCAPRYLYLSILANE, PHENOXYETHANOL, CAPRYLYL GLYCOL, IRON OXIDES (CI 77499), TITANIUM DIOXIDE (CI 77891), RED 6 (CI 15850), MANGANESE VIOLET (CI 77742), RED 7 (CI 15850), ULTRAMARINES (CI 77007). SHADES 12, 35. INGREDIENTS (INGRÉDIENTS): MICA, TALC, DIMETHICONE, PENTAERYTHRITYL TETRAISOSTEARATE, MAGNESIUM STEARATE, HYDROGENATED POLYISOBUTENE, SILICA, POLYETHYLENE, PTFE, TRIETHOXYCAPRYLYLSILANE, PHENOXYETHANOL, CAPRYLYL GLYCOL [+/- MAY CONTAIN/PEUT CONTENIR: IRON OXIDES (CI 77491, CI 77492, CI 77499), TITANIUM DIOXIDE (CI 77891), RED 40 (CI 16035), RED 6 (CI 15850), RED 7 (CI 15850), YELLOW 6 (CI 15985)]. SHADE 14. INGREDIENTS (INGRÉDIENTS): MICA, TALC, DIMETHICONE, MAGNESIUM STEARATE, PENTAERYTHRITYL TETRAISOSTEARATE, HYDROGENATED POLYISOBUTENE, SILICA, POLYETHYLENE, PTFE, TRIETHOXYCAPRYLYLSILANE, PHENOXYETHANOL, CAPRYLYL GLYCOL, IRON OXIDES (CI 77491, CI 77499), RED 40 (CI 16035), RED 7 (CI 15850), ULTRAMARINES (CI 77007). SHADE 24. INGREDIENTS (INGRÉDIENTS): MICA, TALC, DIMETHICONE, MAGNESIUM STEARATE, PENTAERYTHRITYL TETRAISOSTEARATE, POLYETHYLENE, HYDROGENATED POLYISOBUTENE, SILICA, PTFE, TRIETHOXYCAPRYLYLSILANE, PHENOXYETHANOL, CAPRYLYL GLYCOL, IRON OXIDES (CI 77491, CI 77492, CI 77499), TITANIUM DIOXIDE (CI 77891), RED 7 (CI 15850), BLUE 1 (CI 42090). SHADE 21. INGREDIENTS (INGRÉDIENTS): MICA, TALC, DIMETHICONE, PENTAERYTHRITYL TETRAISOSTEARATE, POLYETHYLENE, MAGNESIUM STEARATE, HYDROGENATED POLYISOBUTENE, SILICA, PTFE, TRIETHOXYCAPRYLYLSILANE, PHENOXYETHANOL, CAPRYLYL GLYCOL, IRON OXIDES (CI 77491, CI 77499), TITANIUM DIOXIDE (CI 77891), RED 7 (CI 15850), ULTRAMARINES (CI 77007). SHADE 22. INGREDIENTS (INGRÉDIENTS): TALC, MICA, DIMETHICONE, PENTAERYTHRITYL TETRAISOSTEARATE, POLYETHYLENE, MAGNESIUM STEARATE, HYDROGENATED POLYISOBUTENE, SILICA, PTFE, TRIETHOXYCAPRYLYLSILANE, PHENOXYETHANOL, CAPRYLYL GLYCOL, IRON OXIDES (CI 77499), RED 7 (CI 15850), ULTRAMARINES (CI 77007). SHADE 27. INGREDIENTS (INGRÉDIENTS): MICA, TIN OXIDE, TALC, DIMETHICONE, PENTAERYTHRITYL TETRAISOSTEARATE, HYDROGENATED POLYISOBUTENE, MAGNESIUM STEARATE, SILICA, POLYETHYLENE, PTFE, TRIETHOXYCAPRYLYLSILANE, PHENOXYETHANOL, CAPRYLYL GLYCOL, TITANIUM DIOXIDE (CI 77891), RED 7 (CI 15850), ULTRAMARINES (CI 77007), BLACK 2 (CI 77266). SHADE 33. INGREDIENTS (INGRÉDIENTS): MICA, CALCIUM ALUMINUM BOROSILICATE, DIMETHICONE, PENTAERYTHRITYL TETRAISOSTEARATE, HYDROGENATED POLYISOBUTENE, MAGNESIUM STEARATE, SILICA, TALC, POLYETHYLENE, TIN OXIDE, PTFE, TRIETHOXYCAPRYLYLSILANE, PHENOXYETHANOL, CAPRYLYL GLYCOL, IRON OXIDES (CI 77491, CI 77492, CI 77499), TITANIUM DIOXIDE (CI 77891), RED 40 (CI 16035), RED 27 (CI 45410), ULTRAMARINES (CI 77007). SHADE 34. INGREDIENTS (INGRÉDIENTS): MICA, CALCIUM ALUMINUM BOROSILICATE, TALC, DIMETHICONE, PENTAERYTHRITYL TETRAISOSTEARATE, HYDROGENATED POLYISOBUTENE, TIN OXIDE, MAGNESIUM STEARATE, SILICA, POLYETHYLENE, PTFE, TRIETHOXYCAPRYLYLSILANE, PHENOXYETHANOL, CAPRYLYL GLYCOL, IRON OXIDES (CI 77491, CI 77499), TITANIUM DIOXIDE (CI 77891), RED 40 (CI 16035), RED 7 (CI 15850). SHADE 36. INGREDIENTS (INGRÉDIENTS): MICA, TALC, DIMETHICONE, SILICA, MAGNESIUM STEARATE, PENTAERYTHRITYL TETRAISOSTEARATE, HYDROGENATED POLYISOBUTENE, POLYETHYLENE, TIN OXIDE, PTFE, TRIETHOXYCAPRYLYLSILANE, PHENOXYETHANOL, CAPRYLYL GLYCOL, IRON OXIDES (CI 77492, CI 77499), TITANIUM DIOXIDE (CI 77891), RED 40 (CI 16035), ULTRAMARINES (CI 77007). La he recibido esta mañana y me ha encantado, una gran variedad de sombras y los colores preciosos. Aún no he tenido tiempo de probarla. Y, la presentación es genial, muy elegante. Advantage: Con tanta variedad de tonos puedes hacer muchos looks. Está superbien, tiene un buen empaque y las sombras metalizadas pigmentan muy bien. 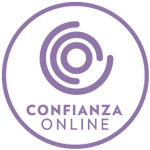 La relación calidad-precio es inmejorable. Advantage: Casi todas las sombras son de calidad. Disadvantages: La tapa del espejo pesa más que la de las sombras pesa más y es un poco incómoda. Cores com boa pigmentação ???? Top» Makeup» Eyes» Eyeshadow» Eyeshadow palette» Revolution - Eyeshadow Palette - Shook!